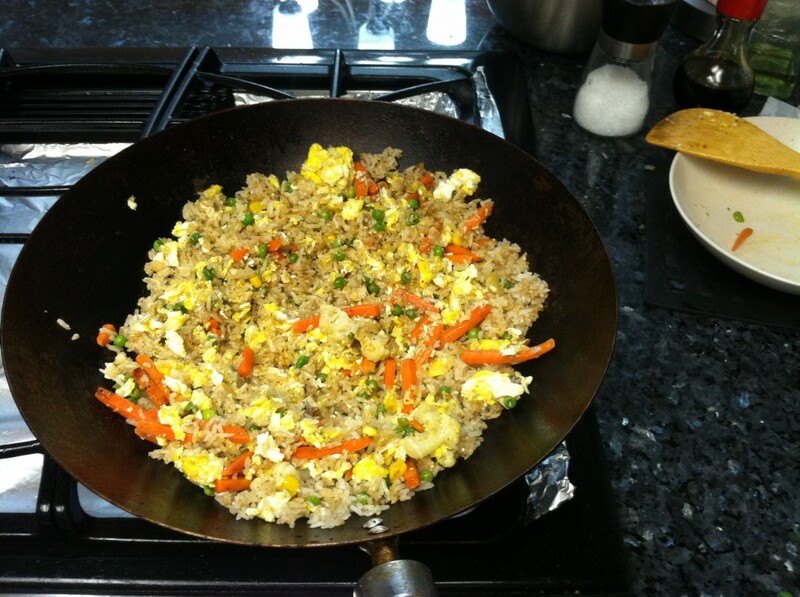 Fried rice is so simple yet so hard to make. I know that sounds weird but it is true, the most simple dishes are usually the hardest to make because it is all about the technique since the ingredient list is so short. All you need is 2 – 3 cups of stale white rice (about one large to-go container), three eggs, frozen peas and carrot strips as your main ingredients, you will also need some soy sauce, salt, white pepper, butter and cooking oil but those are usually items should have on hand if you are a cook. 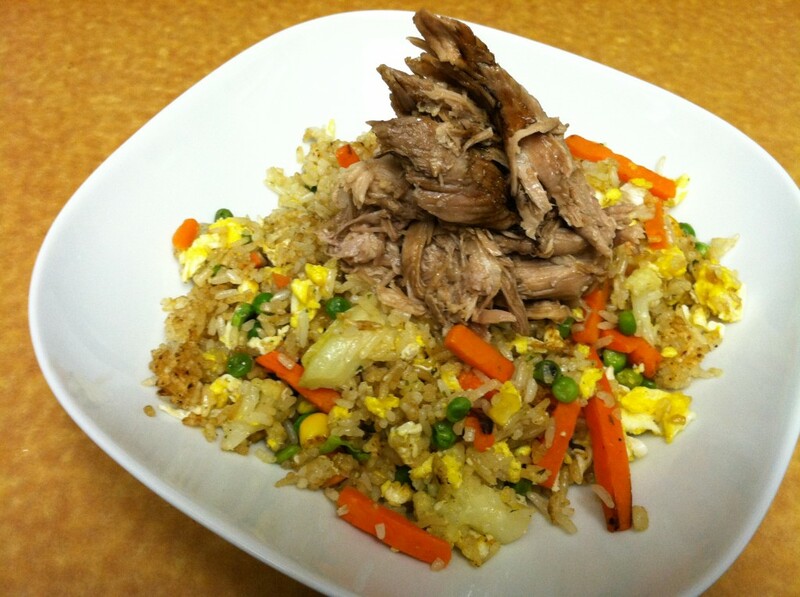 The fried rice can be made and served with almost any dish, but this particular dish was made right after making some Chinese Vegetable Soup which is where the Maggi Pulled Pork came from. The key to fried rice is using stale white rice, at least 2 – 3 days old, the most stale the better because you don’t want any moister within the rice or else it won’t fry properly. The second most important factor is you need a good wok and a hot enough burner because you need high heat to make fried rice. If your stove is lacking is power than I suggest buying fried rice because a weak burner just won’t cut it. Back when I lived in my apartment for college I had to go without home made friend rice for over 2 years because the stove couldn’t cut it. Once I moved into my condo I made sure my stove was powerful enough to make fried rice and any other dish I wanted to make. Take your three eggs and break them into a bowl and stir it up like you were making scrambled eggs. Heat up your wok with high heat add cooking oil to coat the wok then add in 1 Tbsp of butter then quickly throw in your eggs. Once the eggs are 80% cooked remove them from the wok and place them on a plate. Re-coat the wok with oil and another Tbsp of butter then place it back over high heat. Add in your rice and use a spatula or wooden spoon to break up the rice (no clumps). Keep the rice moving around to evenly coat every piece with oil/butter and cook the rice till it turns a light golden brown. keep the rice moving so it doesn’t burn, stir at least once every 10 – 15 seconds and season with finely ground sea or kosher salt. The salt will season the fried rice but also help to pull out moister from the rice. 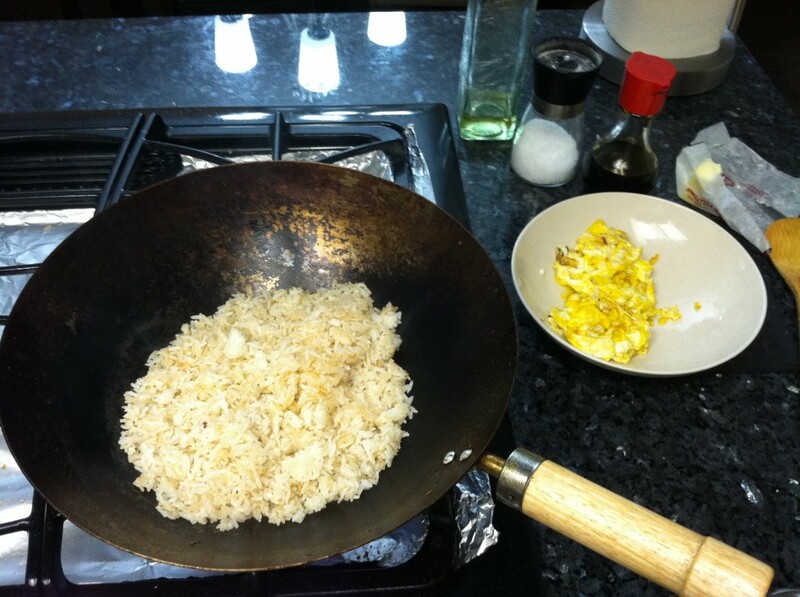 Once your rice is lightly browned remove it from the wok and set aside. Add in your vegetables with additional cooking oil and cook until they are done. Pour your vegetables onto the eggs and mix them around to let the eggs absorb all the liquids from your vegetables. Add your rice back onto the wok and cook until the rice looks like fried rice done. At this time you want to add salt and just a dash of soy sauce. The soy sauce is really just to add some more color, most of the saltiness in fried rice comes from the salt you will add. Once the rice is done add in the vegetables and eggs and mix it around to evenly distribute the vegetables and eggs into the fried rice. 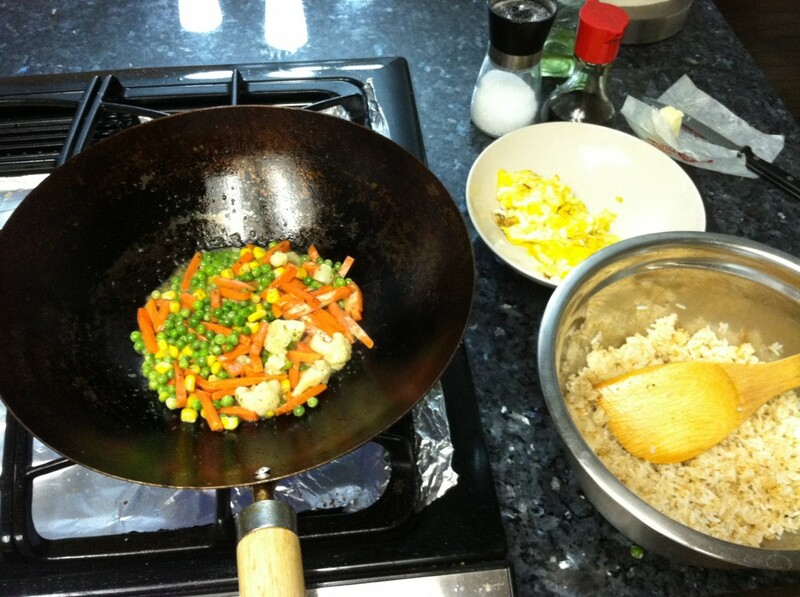 Quickly remove the fried rice from the wok and serve either as a side or as your main course. 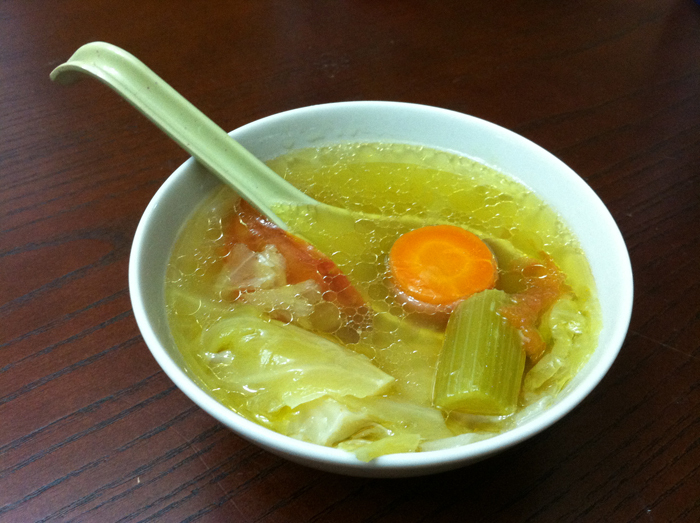 if you want to serve it as your main course you can add in some meat (i.e. 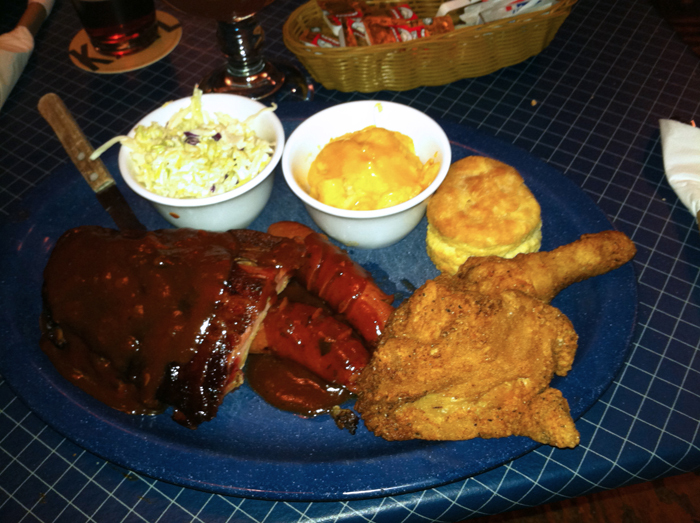 thinly sliced cooked hot dogs, Chinese Sausage, cooked shrimp, Chicken, etc…).